Should people with diabetes eat a Glycaemic Index diet? Whereas the Glycemic Index is a good way of making food choices, Glycemic load helps to work out how different sized portions of different foods compare with each other in terms of their blood glucose raising effect. How is Glycemic load worked out? 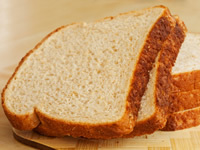 Example: What is the Glycemic load of a slice of whole grain bread? Note these figures are examples. The GI and carbohydrate values may vary slightly between different types and slice sizes of whole grain bread. What counts as a high and low Glycemic load? How useful is Glycemic load? Glycemic load can be useful for people with diabetes to assess which quantities of which foods are likely to be suitable for maintaining good blood glucose levels. This can be illustrated by another example: Jim is going to have roast chicken for dinner and is thinking of having it either with white rice or couscous. Jim has enough white rice to make a 130g (when cooked) portion of rice which will provide 40g of carbohydrate. White rice has a Glycemic index value of 85. He also has enough couscous to make a 200g serving of couscous which will also provide 45g of carbohydrate. Couscous has a Glycemic index value of 60. So, Jim sees that even though the smaller portion of white rice has less carbohydrate, the portion of couscous actually has a lower Glycemic load. The Glycemic load calculation tells Jim that the portion of couscous, despite being larger and containing slightly more carbohydrate, is less likely to cause as sharp a rise in his blood sugar levels as the portion of white rice. Glycemic load can involve a certain amount of calculation which may not be practical for everyone, however, those with time to get the calculations correct may find Glycemic load to be a helpful extra tool in choosing which foods and which portions are suitable for maintaining good blood glucose levels. Assessing the Glycemic load of foods can be particularly useful if you have a specific meal quite often or if you are thinking of trying a new meal but are not sure how it may impact on your blood glucose levels. Note that different people with diabetes will have different tolerances to the carbohydrate in food. Some people may be able to comfortable tolerate meals with a medium Glycemic load, whereas other people may find that they can only tolerate low Glycemic load values. If you have access to blood glucose testing supplies, you may wish to test which Glycemic load values allow you to keep your sugar levels within the recommended guideline blood glucose values. A good way to assess the effect of a particular meal is to test your blood glucose before eating, 2 hours after eating and again 4 hours after eating.